On occasion, the British Government goes through an internal shake-up that leads to various pundits trying to explain to us lesser mortals what it all means. Thus, with changes in the Ministers who work in the Department of Energy and Climate Change, there is a suggestion that the UK is pulling back from their commitment to wind energy, and instead beginning to look more seriously at shale gas supplies. The UK is not unique. The success of the American development of long horizontal well drilling, with follow-on multiple fracture of the shale beds to release gas at economic volumes into the well, has caught the world’s attention, and with it a desire to emulate that success. Though it should be said that the American success comes in part with the volume of the release in supply and the consequent fall induced in the price of natural gas. That, in turn, is providing a less well recognized boost to the US economy, through lower energy costs. This has not been lost on the Chinese, who are fully aware of their own need to keep finding resources at as cheap a price as possible to keep their own economy growing. It is, in relative terms, however, still an industry in its infancy. 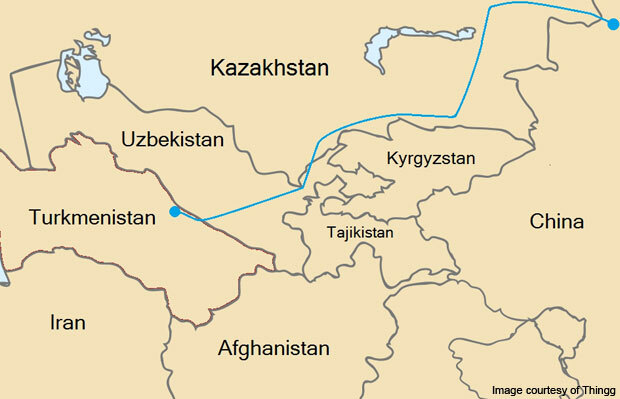 Earlier this year China agreed to buy 65 billon cu m of more conventionally produced natural gas from Turkmenistan – about twice the initial buy - roughly the equivalent of 6.3 billion cu ft/day (bcf/d). 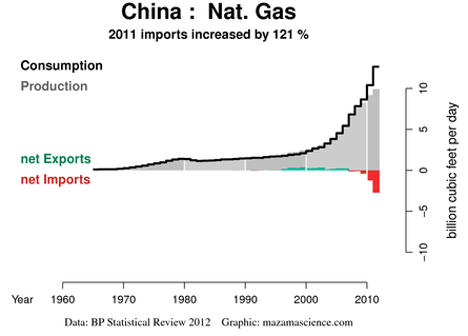 In addition, from April 1, China has started to import natural gas from Uzbekistan. That sale has been projected to be at around 10 bcm/year (1 bcf/day) and there has been a move in Uzbekistan to increase coal-fired power generation in the country in order to free up more gas to meet export demands as the sales to China ramp up to perhaps double this level in the next few years. To put these numbers into perspective China consumed around 12.5 billion cu ft/day (bcf/d) in 2011, which translates into roughly 130 bcm/year, but this rate increased 20% (23 bcm) from 2010 to 2011. (BP 2012 Statistical Review). It is also on track with the stated Government plan that China will consume some 375 bcm/yr (36 bcf/day) of natural gas by 2020, roughly tripling the current volume. Thus, although China has been able to provide for most of its needs until relatively recently, it is now starting to buy increasingly large volumes of natural gas on the international market, just to keep up with demand. There is a flexibility in the supply of natural gas, through pipelines, that make it easier for a country with much mountainous terrain in the West to be able more easily to supply energy to more remote corners, without the heavy infrastructure demands that would be required, for example, to run new rail lines for coal delivery. Figure 3. New gas pipeline being laid in China in 2009. This June Sinopec has started drilling for natural gas in the shales under Chongqing in Sichuan Province. It is the opening step in developing a resource that might be as large as 1,275 Tcf, according to the EIA. 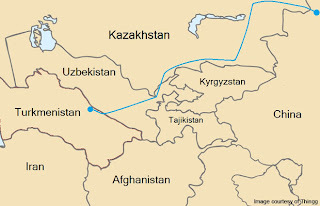 Note that while the supplies coming in from Turkmenistan and Ukbekistan are more easily connected to the northern of the trans-country pipelines, the new drilling in Chongqing looking for shale gas, will supply that into the more southerly of the two major pipelines that Sinopec runs across the country. The Sichuan-Eastern China Natural Gas Transmission Pipeline passes through eight provinces including Sichuan, Chongqing, Jiangxi, Hubei, Anhui, Jiangsu, Zhejiang and Shanghai;the length is 2,246 km. There will be nine wells in the initial test site, with the anticipation that this will yield some 11 to 18 billion feet of gas (per year). Outside this unconventional source of natural gas, Sinopec produced some 517 bcf of natural gas in 2011, up 76 bcf from 2010. Much of this came from the Sulidge gas field in the Ordos Basin , which is also considered to have the second largest potential natural gas resource in shale in the country. 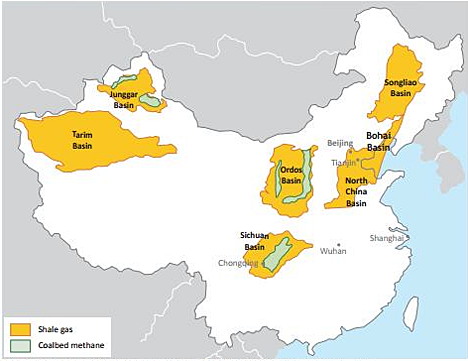 It is hoped that with the development of the shale gas in the two Basins that shale gas will provide some 6.5 bcm/yr by 2015. As with the Chongqing field, there are existing pipelines at the Ordos field that will allow a fairly simple tie in to the national network to bring the new fuel to market, once produced. The potential of this new market for technology has already led Schlumberger to buy into a Chinese Oilfield Services company that will likely be used in the fracturing of the wells, necessary to China since they still lack expertise in the new technologies as they are evolving. That evolution was highlighted recently by articles that have highlighted a number of different technologies that are now both lowering the costs, and increasing the performance of well fracking. These have included the Hiway technology that is now being introduced and which, as with some of the other innovations, allows a significant savings in water, and proppant use during operations, while lowering costs and increasing productivity. These factors, particularly the significant lowering of cost, are likely to help in improving the economics of a shale gas industry which continues, at least in the United States, to have problems with return on investment, despite, or perhaps because of the large volumes of resource that it is making available. That is, however, much less likely to be a problem with the Chinese resource.